Just when it seemed like everything was going Nebraska’s way, setting up for a big 2018-19 season, Thursday’s news dropped about junior center Jordy Tshimanga leaving the program. In the grand scheme of things, Tshimanga’s departure doesn’t dramatically change the Huskers’ outlook. Their ceiling is still quite high. He wasn’t projected to be a starter after his struggles and Isaiah Roby’s emergence as a small-ball center last season. The loss is a hit to Nebraska’s depth, certainly. Tshimanga’s departure means the Huskers lose their biggest body at 6-foot-11 and 275 pounds, and it leaves them with Isaac Copeland, Roby, walk-on Tanner Borchardt and true freshman Brady Heiman as frontcourt options. Can Nebraska rely on Borchardt to eat up all of the minutes that would have gone to Tshimanga? Can they get production out of the 205-pound Heiman immediately rather than having him redshirt? I don’t feel confident that the answer is yes to either one of those questions. Nebraska still has two open scholarships now, so perhaps Tim Miles and company can pull a rabbit out of their hat and find an immediately eligible big man to bolster the frontcourt depth. 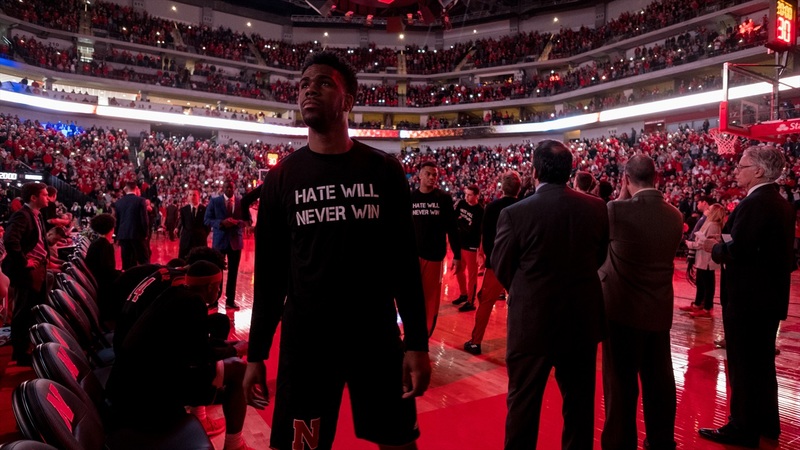 Either way, this is the latest chapter in what has become an ongoing problem at Nebraska for Tim Miles. When Miles secured a commitment from Tshimanga late in the 2016 recruiting cycle, it was seen as a major coup. After struggling to recruit the center position, Nebraska beat out some quality programs for a fringe top-150 recruit. However, Tshimanga showed how raw he was early and often and could never quite find a way to consistently produce in his two season with the Huskers, and now he’s gone. In fact, he’s just the latest in a long line of frontcourt players to finish heir careers elsewhere. Since arriving in Lincoln, Miles has not recruited a single high school big man who has finished his career at Nebraska. Read that again: not one. Here are the players Miles has recruited to Nebraska to play in the post since he arrived in Lincoln: Sergej Vucetic (7-foot-1, 236 pounds), Leslee Smith (6-foot-8, 255 pounds), Walter Pitchford (6-foot-10, 234 pounds), Moses Abraham (6-foot-9, 255 pounds), Jake Hammond (6-foot-10, 230 pounds), Michael Jacobson (6-foot-8, 222 pounds), Ed Morrow Jr. (6-foot-7, 225 pounds), Jordy Tshimanga 6-foot-11, 275 pounds), Isaac Copeland (6-foot-9, 220 pounds), Duby Okeke (6-foot-8, 247 pounds) and Brady Heiman (6-foot-11, 205 pounds). Pitchford, Smith, Abraham, Copeland and Okeke all began their careers elsewhere. Vucetic, Hammond, Jacobson, Morrow and now Tshimanga all began their careers in Lincoln but will finish them elsewhere. Heiman has been with the program for about two months. That doesn’t factor in the likes of Jack McVeigh, Jeriah Horne or Nick Fuller, all of whom were three/four tweeners who also left the program. To Miles’ credit, he has done a great job mining the transfer market to make up for his struggles recruiting the high school ranks. Pitchford, one of his first recruits when he first arrived in Lincoln, helped the Huskers make the NCAA Tournament as a stretch-five (before foregoing his final year of eligibility). Nebraska hopes Copeland can do the same as a senior after helping the Huskers win 22 games as a junior. Smith was a useful role player when he was healthy. That being said, today’s depth problem has a lot to do with Nebraska’s inability to identify, recruit and develop high school bigs. Bill Moos is looking to see if Tim Miles can build a sustainable winning program at Nebraska rather than riding one hot cycle of talent. It’s going to be difficult to do so if they can’t recruit a Big Ten-caliber frontcourt. Isaiah Roby was another of those tweeners like McVeigh when he arrived at Nebraska, but he has developed into a full-fledged match-up nightmare for opposing centers and power forwards. He is heading into his junior season as a trendy pick for a breakout season, and Nebraska is going to need it more than ever now without Tshimanga in the fold. If the Huskers can find a couple more like him, they’ll be just fine.